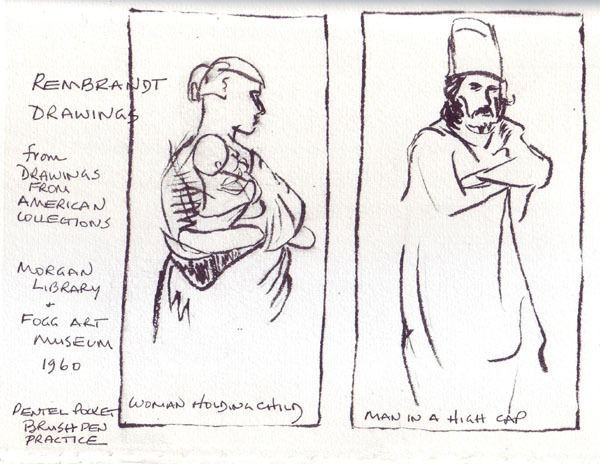 I am having trouble getting used to the Pentel Pocket Brush Pen and decided that I should sketch a few Rembrandt drawings in pencil and then quickly draw them with the Pentel. I wish that I could control it better, but here they are for all to see. I tried to copy line for line from the Master from his very quick sketches. I really liked the exercise described by Joanne last week on the EDM Message Board and finally found a full frontal magazine ad. 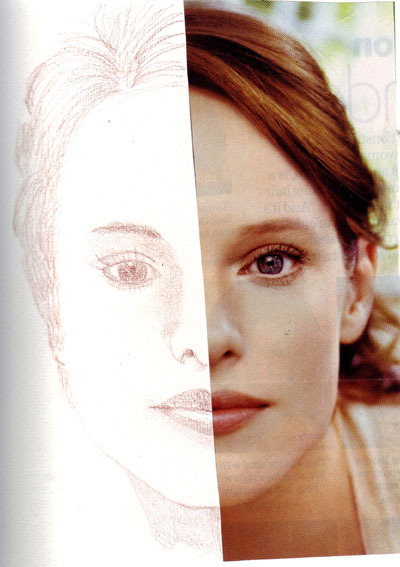 My favorite drawing pencil is a Mahogany color watercolor pencil and unfortunately it doesn't scan very well. But I was pleased with the exercise and will continue to look for more photos. I haven't scanned the last 3 EDM challenges, yet. 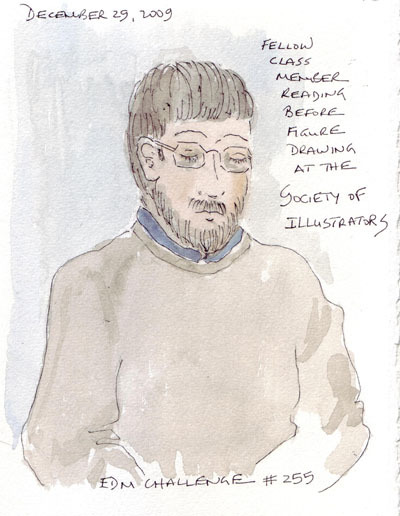 The best I could do was to draw the person sitting across from me, at the Society of Illustrators, waiting for the live figure drawing session to begin. 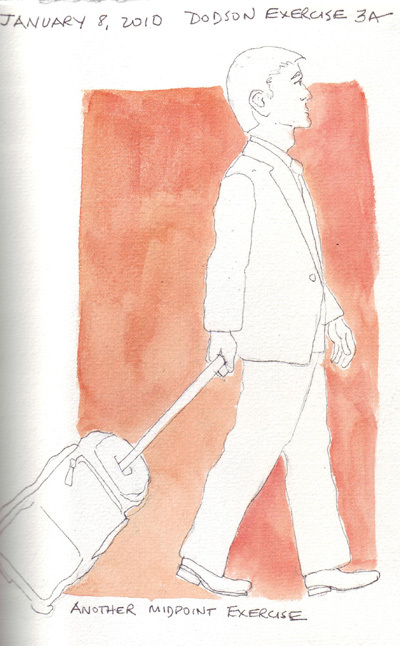 He was reading and therefore didn't know I quickly sketched him. 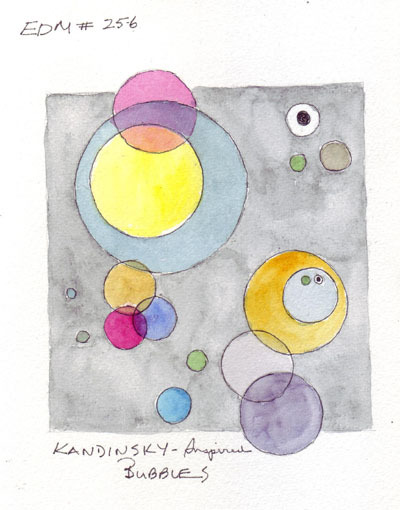 There was a huge Kandinsky exhibit at the Guggenheim, and I was inspired by one of his paintings to draw these bubbly-looking circles. 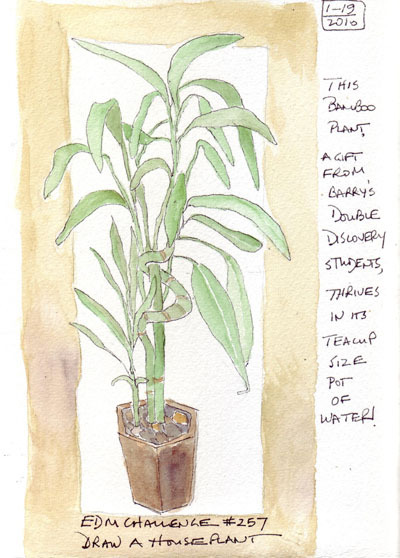 This bamboo plant was a gift from students to my husband, and I'm amazed at how big these plants can grow from this tiny ceramic container and only water. I use watercolor journals for my daily sketchbooks/visual journals and for the last 18 months I used books I made with commercial bookcloth on the covers. This year, while experimenting with corn dextrin resist, I created pieces of fabric that I thought would make fun book covers for my art journals and remembered a blog entry about "paper-backing fabric as book cloth" by Roz Stendahl. I made 4 different pieces of cloth to try and decided to make a completely experimental journal - one that I wouldn't grieve over if it didn't meet my expectations. 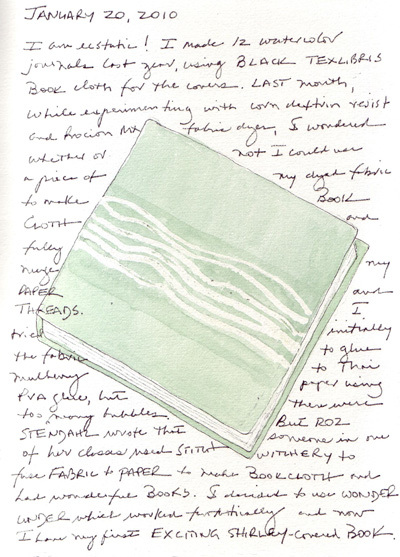 I used Fabriano Artitico to make my watercolor journals with 140 lb soft press paper that was grain long - and could use full sheets to make books that were approximately 5.5" X 7.5". I love this size because it fits comfortably into a small leather backpack, is portrait format, and and the pages are just big enough for my drawings. However, last year Fabriano Artistico paper was changed to grain short and I could no longer make that size book from 1 1/2 sheets and with 2 full sheets, there was considerable waste. So this experimental book was redesigned to be 7.5" wide and 7.3" high. I never worked in a square format, so this was a perfect time to try it. I followed Roz's instructions precisely (I thought), but was unable to glue (PVA) the fabric to the Thai mulberry paper without bubbles. I allowed it to dry and then carefully peeled it off and then tried option #2. 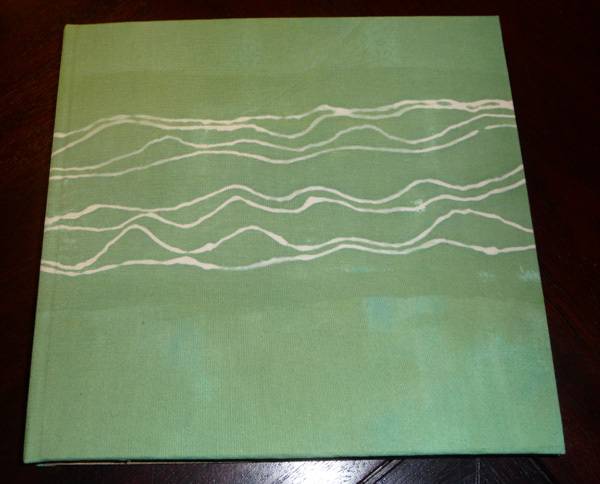 In her blog entry Roz describes book cloth made by someone in her classes using Stitch Witchery as the fusible. I used Wonder Under (another polyamide) in machine applique since it was marketed in 1986 - and remembered a scientific study done by Drs. Evenson and Crews, of the International Quilt Study Center, at the University of Nebraska - Lincoln, in which they studied "selected quilting products containing adhesives" (Quilters Newsletter, March 2004). Stitch Witchery and Wonder Under were comparable in their lightfastness tests and artifical aging experiments - both were proved acceptable for quilts intended as heirlooms to last less than 100 years. At 100 years of artificial aging, there was slight yellowing. Since I have no guarantee that my family won't put my sketchbooks in terminal storage considerably before 100 years, I considered this an acceptable risk! 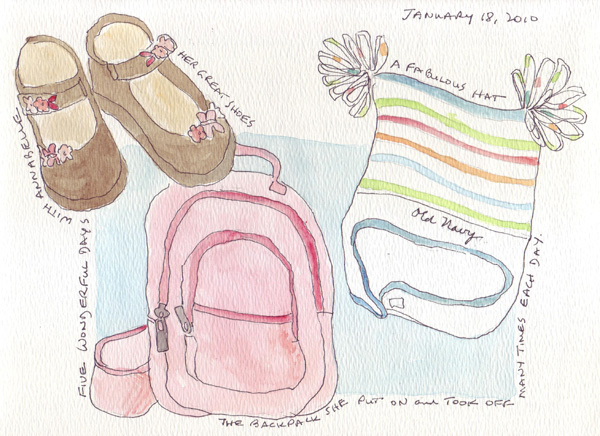 Here are photos and a journal page celebrating my new, beloved, watercolor journal. 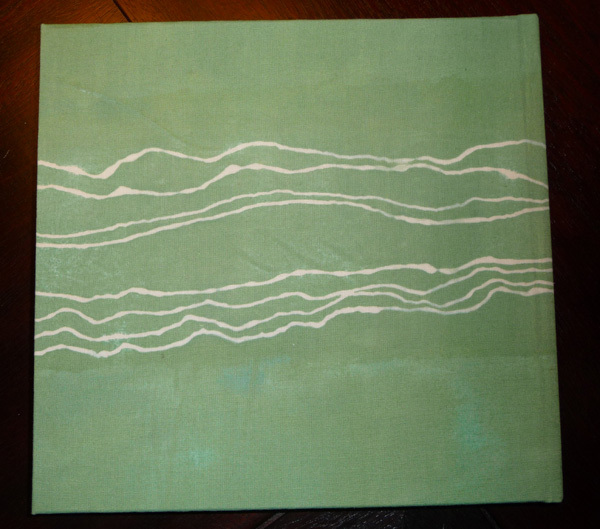 The fabric was made with green and blue procion MX dyes and corn dextrin resist to make the squiggly lines. 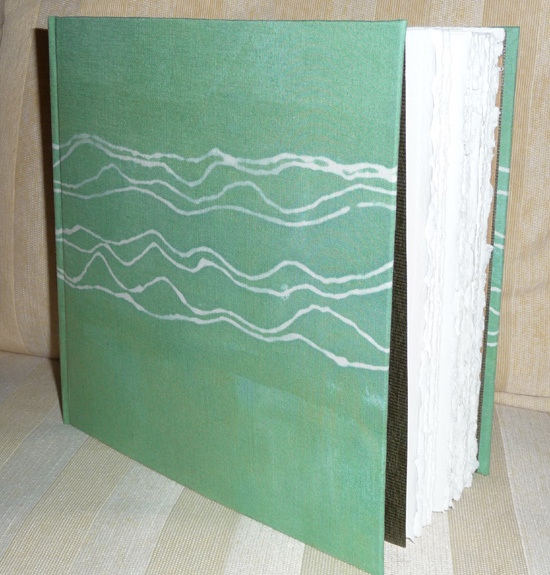 It was then ironed onto the paper using Wonder Under and handled just like book cloth to make my journal cover. I'm in love!! We were in Washington DC over the holiday weekend visiting our grand daughter Annabelle. When she was born, I decided to keep a separate watercolor journal just for my daily sketches during the days I was visiting her. 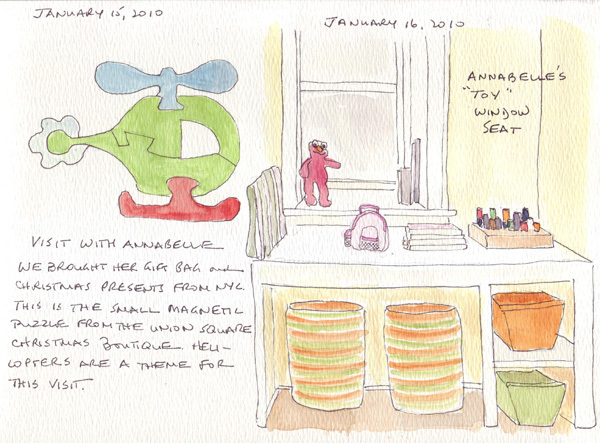 This journal page shows the helicopter magnetic puzzle - the smallest Christmas present that we brought in her big, full Christmas gift bag and a window seat that houses her toys in a group of storage baskets. Some of Annabelle's clothes that I wanted to remember - and her special infant backpack - that she put on and took off repeatedly over the weekend. On Sunday morning we went to the Air and Space Museum at Dulles - an amazing place with an incredible number of planes, helicopters, missiles, and space vehicles. Annabelle loves to run through the gigantic hangar, so this sketch was done from a photo that I took as we ran with her. 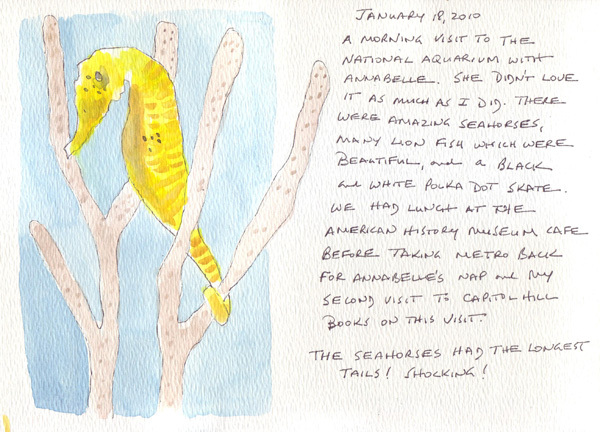 On Monday morning we took the Metro to the Commerce Dept - and the National Aquarium. It is a lovely, small collection of tanks - and I was captivated by the seahorses. Their tails were so much longer than I had imagined and were wrapped around the tank plant holding them all in position. Annabelle wasn't nearly as interested in fish as she was in airplanes! As I started 2010, I finally overcame my block in the chapter 2 exercises in the Bert Dodson book Keys to Drawing, and now I'm working on Chapter 3. 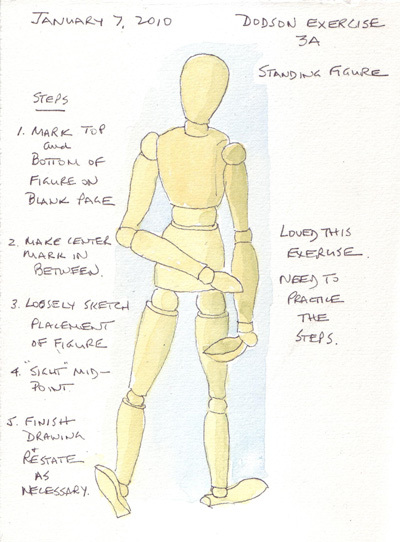 This is a great set of exercises re: measurement since I often have trouble fitting figures onto the page. Here are two figures drawn by marking the top, the bottom, and then the midpoint. 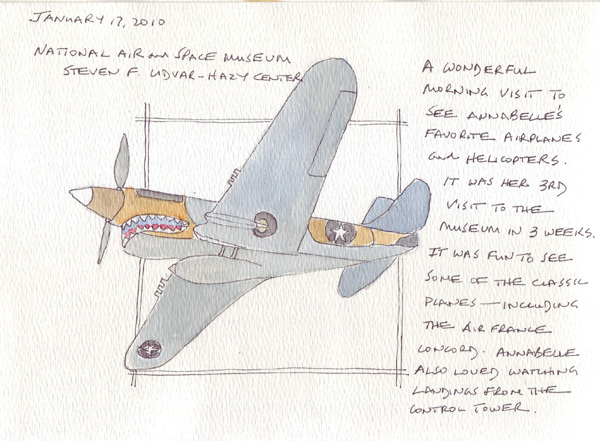 Then a quick drawing was done and the actual midpoint measured by sighting before working further on the drawing. This is very different than my usual technique of starting with the head and then hoping that the feet fit on the page!